Traditional metal braces have been used to move teeth for over 100 years and have long been the gold standard in orthodontic treatment. Metal braces are durable, predictable, and correct all kinds of unhealthily bites. When we show parents examples of our traditional braces, most say “Wow, those look nothing like the braces I had when I was a kid.” They are exactly right. 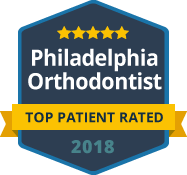 Broad Street Braces uses only the most advanced metal braces- these braces are smaller, sleeker, less bulky, more comfortable, and easier to clean than ever before. And of course, you will get to choose your colors at each of your visits!